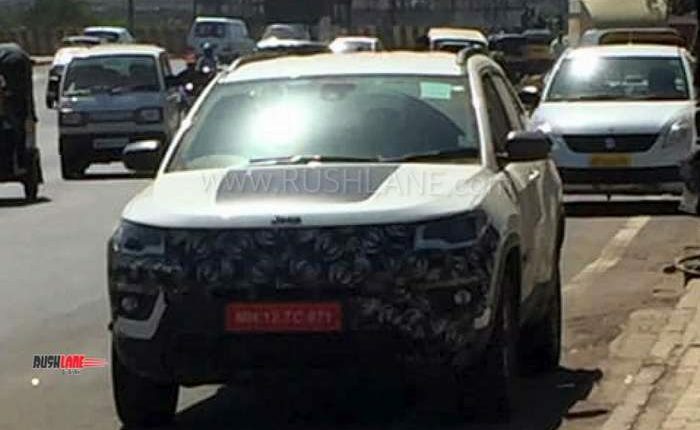 As FCA continues testing the Jeep Compass Trailhawk in India for the local launch by June, yet another batch of spy shots has surfaced online, courtesy RushLane reader Sarthak Shewale. 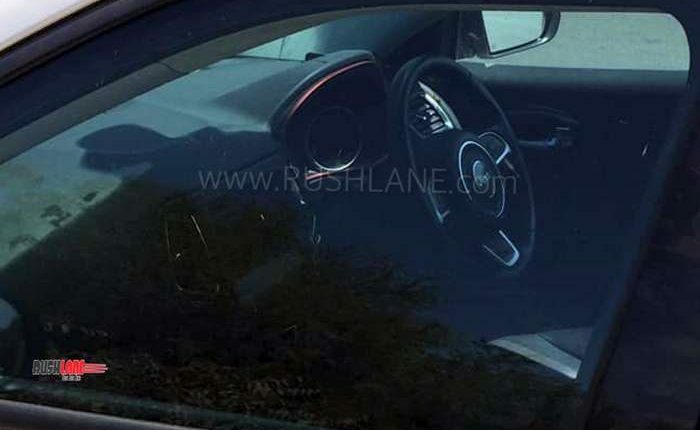 One of the new images gives a glimpse of the SUV’s interior as well. A sat-nav and a full-colour driver information display could debut on the Indian-spec Compass on the Trailhawk variant. The interior spy shot of the Jeep Compass Trailhawk isn’t very clear, but it does show that the cabin has a black theme and contrasting red accents. None of the currently available configurations in India features the Uconnect 8.4NAV infotainment system with GPS navigation and the 7-inch full-colour driver information display into which this system is integrated into it. One can only hope that at least the Trailhawk variant comes with these features. The Jeep Compass Trailhawk features unique fascias with 30-degree approach angle, 24-degree breaker angle and a 34-degree departure angle. It has an off-road suspension for increased ground clearance. It comes with the exclusive Jeep Active Drive Low 4x4 system with a 20:1 crawl ratio as well as the exclusive Rock mode in the Selec-Terrain system. The Selec-Terrain system in the Trailhawk variant includes Select-Speed Control with Hill Descent Control as well for even greater Trail Rated off-road capability. The Jeep Compass Trailhawk will employ a BSVI-compliant 2.0-litre MultiJet II diesel engine. While reports say that it will come with a 9-speed automatic transmission, the driving conditions in India (including the 120 km/h speed limit) don’t call for this sophisticated unit that would significantly bump the price of the SUV. FCA is figuring out cost-cutting measures, and these may include deletion of some features most customers in our market wouldn’t require, such as heated front seats. Also, the company could throw in some more exterior visual exclusivities in addition to the exclusive colour-coding for the grille, mirrors and the roof rails, unique 17-inch alloy wheels and the Trail Rated badges. The Jeep Compass Trailhawk will employ a BSVI-compliant 2.0-litre MultiJet II diesel engine. At close to INR 30 lakh (ex-showroom Delhi), the Jeep Compass Trailhawk will likely cost nearly double than the most basic configuration.